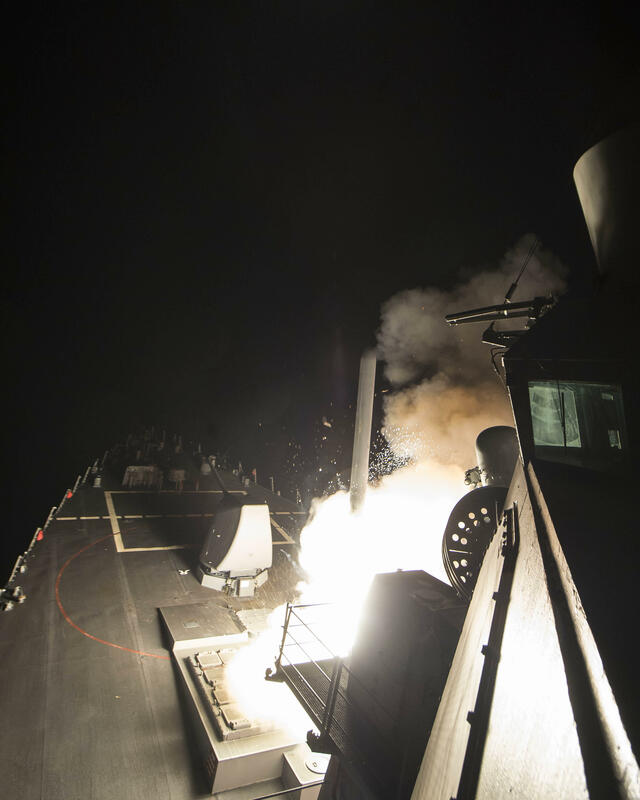 BREAKING NEWS: The U.S. launched cruise missiles against a Syrian regime target in retaliation for a chemical attack. In a televised statement, Mr. Trump said he authorized the airstrike because "it is in the vital, national security interest of the United States to prevent and deter the use of deadly chemical weapons." After changing his position on Syrian President Bashar Assad staying in power earlier Thursday, Secretary of State Rex Tillerson briefed President Trump on military options in Syria. In an impromptu press conference, Tillerson said of Assad, "It will seem that there would be no role for him to govern the Syrian people." When asked about a possibility of removing Assad, Tillerson replied "Those steps are underway." 2:49 a.m.: A communication link between the U.S. and Russia used to protect their pilots flying sorties over Syria was used ahead of an American missile strike on the country. The so-called "deconfliction line" is operated by the U.S. military's Central Command at the sprawling al-Udeid Air Base in Qatar. It serves as a crucial link to make sure the increasingly crowded Syrian airspace doesn't see any accidental collisions or attacks on each other. Pentagon spokesman Capt. Jeff Davis says: "U.S. military planners took precautions to minimize risk to Russian or Syrian personnel located at the airfield" targeted in Syria's Homs province. U.S. Central Command did not immediately respond to an Associated Press query on specifics of how the line was used. 2:47 a.m.: Turkey has welcomed the U.S. missile strike on Syria, saying it was an "important and meaningful" development but called for a continued tough stance against President Bashar Assad that would render him "no longer able to harm his people." Deputy Prime Minister Numan Kurtulmus said in a live television interview Friday: "It is imperative that the Assad regime is fully punished by the international community." Turkey is a strong opponent of Syrian President Bashar Assad and has backed the Syrian opposition fighting against him. 2:19 a.m.: The Russian government said Friday that the U.S. strike on Syria is "aggression against sovereign state in violation of international law," The Associated Press reports. Putin's spokesman Dmitry Peskov said in Friday's statement carried by Russian news agencies that Putin believes that the U.S. has dealt the strikes under "far-fetched pretext." 1:32 a.m.: The Syrian Observatory for Human Rights, British-based opposition group, said early Friday that at least four people were killed in the airstrike, AP reports. One of the people killed was a general, the group said. The missile attack damaged over a dozen hangars, a fuel depot and an air defense base, according to the group. 12:58 a.m.: Rep. Tulsi Gabbard, D-Hawaii, who visited Syria in January, said in a statement that the airstrike was "reckless and short-sighted." 12:35 a.m.: Israeli Prime Minister Benjamin Netanyahu released a statement praising Mr. Trump's "strong and clear message" in conducting the strike. 11:47 p.m.: Tillerson told reporters that Mr. Trump made the decision Thursday to launch the missile strike. "This clearly indicates the President is willing to take decisive action," Tillerson said. National Security Adviser HR McMaster said "the possibility of these weapons falling into other hands is a direct threat." Tillerson stressed there was no discussion with Moscow ahead of the strike. 11:34 p.m.: The Shayrat Airfield was targeted because it is where the chemical weapons that were used in the attack in the Idlib province, CBS News' national security correspondent David Martin reports. This type of attack was chosen because it "carried least risk for Americans," Martin reports. According to Martin, the strike is a "direct response to the chemical weapon attack." While it's unclear if more chemical weapons were stored in Shayrat, Martin noted that the U.S. developed weapons during the Bush administration that were intended to strike chemical weapons facilities and used at high heats to vaporize the gas. It's unclear if those types of weapons were used, but McMaster said "there were measures in place to avoid" hitting any possible chemical weapons. 10:51 p.m.: Tillerson said Russia is either complicit or "simply incompetent" for not adhering to a 2013 commitment to secure Syria's chemical weapons, the Associated Press reports. 10:49 p.m.: House Speaker Paul Ryan called the strike "appropriate and just." At the end of the statement, Ryan said he looks "forward to the administration further engaging Congress in this effort." What is Congress saying about the Syria missile strike? 10:42 p.m.: Two dozen members of Congress were notified by White House and Cabinet officials of the airstrike, a White House official tells CBS News. The White House will be providing a list of these members shortly that includes people on both sides of the aisle. 10:39 p.m.: In a statement, the Pentagon said a total of 59 Tomahawk Land Attack Missiles targeted aircraft, petroleum and logistical storage, ammunition supply bunkers, air defense systems and radars. The Pentagon stressed that "extraordinary measures" were taken to avoid civilian causalities. Russian forces were notified in advance of the strike, the Pentagon said. The Pentagon confirmed that the strike targeted Shayrat Airfield in Homs. 10:32 p.m.: Syrian opposition leader Riyad Hijab tells CBS News that he believed Assad carried out the chemical attack to test Mr. Trump. "Everybody is waiting for what Mr. Trump is going to do," Hijab said. Hijab, who was in Washington, said Mr. Trump would have been blamed for the war in Syrian if he followed the same course of action as former President Obama. "To be silent regarding a crime is similar to committing a crime itself," Hijab said. 10:14 p.m.: Syrian state TV called the airstrike an "act of aggression," the AP reports, and that it will "lead to losses." 10:07 p.m.: Democratic Sen. Ben Cardin said in a statement that he supported the airstrike, but stressed that "any longer-term or larger military operation in Syria by the Trump administration will need to be done in consultation with the Congress." Republican Sen. Rand Paul said on Fox News Radio's "Kilmeade & Friends" that the Congress would have to authorize any military action, according to CNN. 10:01 p.m.: In a televised statement, Mr. Trump said he authorized the airstrike because "it is in the vital, national security interest of the United States to prevent and deter the use of deadly chemical weapons." Mr. Trump condemned the chemical attack in the Idlib province, saying that "no child of God should ever suffer such horror." 9:46 p.m.: Mr. Trump gave a brief statement in Florida. He said he authorized the strike and there is no dispute Syria used "banned chemical weapons." 9:39 p.m.: U.S. Sens. John McCain and Lindsey Graham said in a joint statement that the U.S. has "sent an important message the United States will no longer stand idly by as Assad, aided and abetted by Putin's Russia, slaughters innocent Syrians with chemical weapons and barrel bombs." "Unlike the previous administration, President Trump confronted a pivotal moment in Syria and took action. For that, he deserves the support of the American people," the statement read. 9:21 p.m.: Fifty-nine cruise missiles were launched from ships in the eastern Mediterranean, Martin reports. The airfield targeted, Shayrat, is located about 50 miles due south of the village that was hit in a gas attack. All of the Tomahawk missiles are designed to hit within one minute of each other -- and each cruise missile carries a 1,000 pound warhead, according to Martin. That amounts to about 59,000 pounds of explosives in under 60 seconds. 9 p.m.: Two destroyers armed with cruise missiles are positioned in the eastern Mediterranean, CBS News reports. Cruise missiles are unmanned aircraft which carry a 1,000-pound warhead. They fly close to the ground below enemy air defenses, guided to their targets by GPS satellites. 8:40 p.m.: At the U.N., Assad's ally, Russia, warned the U.S. that there could be "negative consequences" if the U.S. took military action in Syria. Russia, which has provided military support for the Syrian government since September 2015, had indicated earlier on Thursday that its support of the Assad regime is not unconditional. Aboard Air Force One on Thursday, President Trump told reporters that "something should happen" to Assad following the chemical attack. "I think what Assad did is terrible. I think what happened in Syria is one of the truly egregious crimes. It shouldn't have happened. It shouldn't be allowed to happen," he said. "I think what happened in Syria is a disgrace to humanity. He's there, and I guess he's running things, so something should happen." Mr. Trump on Wednesday called the attack "heinous," initially declaring that his position on Assad's regime had changed. He called Tuesday's chemical attack "a chemical attack that was so horrific in Syria against innocent people, including women, small children and even beautiful little babies, their deaths were an affront to humanity." "These heinous actions by the Assad regime cannot be tolerated," Mr. Trump told reporters at the Rose Garden after meeting with King Abdullah II. "The United States stands with our allies across the globe to condemn this horrific attack and all other horrific attacks, for that matter." On Thursday, Mr. Trump's Democratic rival in the 2016 election, former Secretary of State Hillary Clinton, said at the Women in the World summit that she had support a more aggressive policy against Syria. But, she said, Assad had "an air force, and that air force is the cause of most of the civilian deaths," which is why she had supported a no-fly zone. "I believe we should have -- and still should -- take out his airfields and prevent him from being able to use them," Clinton said.